Remember this Tim? 1983 I think, 8 VW gyros, and all in the air at the same time!!!! 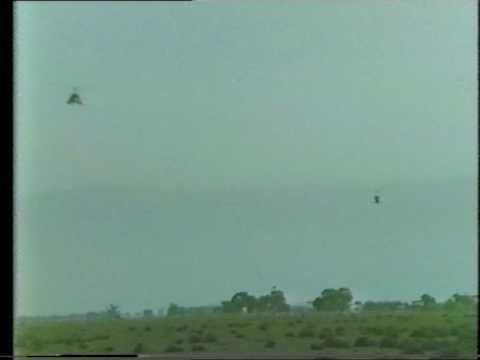 Fabulous footage, one for ASRA archives I reckon. Great stuff. I've never had a go at a vw gyro. It's on my bucket list. Thanks for re-posting RossM. I would like to hear/read that story sometime on the quietest gyro. I've been told recently that there is an old bensen with a VW motor init for sale somewhere near childers ,[ qld] if anyone was interested I could ask more questions about where it is . I was cruising along in my Higgans VW gyro a few decades ago when the air cleaner vibrated off and hit the 53 inch wooden prop. removing 90% of the wood on one blade creating a sudden out of balance that caused one of the four 3/8 bolts holding the engine to shear at the same time throwing the A/Cleaner forwards to smash the dist. cap and automatically shutting down the engine. I preformed a normal no engine landing but became a fanatic for safety wiring air cleaners and other components. Had the engine not shut down I believe it would of parted from the aircraft before I had time to shut down. The only problem I had with direct drive gyro's apart from the lack of thrust was the prop. noise which seemed to have a phycological efect on my brain and created excesive fear. However a bit of fear I believe is good for us. Probably cleans out a few arteries and allows you to live longer! I'm always weary of a person with little or no fear. Several decades ago a bloke flew his VW to a fly-in in SA and taxied up to the group and when he turned off the ignition his wooden prop. fell off! The centrebolt apparently was broken and the prop. stayed on while there was thrust and a key holding the hub.